It’s that time of year again! The United Wrestling Coalition is hosting their annual UWC Toys For Tots Pro Wrestling Toy Drive on Saturday, December 2, 2017. The event will take place at Kelly's Banquet Hall in Wrightstown, New Jersey. Doors open at 6:30 and bell time is slated for 7:00 p.m. Admission is FREE when you donate a new, unwrapped toy (with a suggested minimum value of $10) or a $10 Walmart gift card for Houston flood victims at the door. Toys collected are distributed by members of the US Marine Corps Reserves and stay within Burlington County. Everyone making a donation at the door will receive FREE door prize tickets for their chance to win one of over 50 door prizes. Additional door prize tickets will be available for purchase. Special ringside seating is being reserved for those pledging (in advance of the 12/2 show) to donate a new bicycle. One bicycle donation will reward you up to five reserved seats. To make your pledge to donate a bike, call or text 609-792-9328. In the main event, reigning UWC Heavyweight Champion T.G.I. Fredo Majors of The Fraternity will defend his title against one half of the UWC Tag Team Champions, "American Muscle" Nate Mustang of The Sons Of Liberty! After stealing The Wrightstown Rumble from Mustang and going on to win the Heavyweight Title in June, Fredo Majors defeated Nate Mustang via disqualification in October when Referee George Pinaha mistakenly believed Mustang intentionally clobbered him. At our November event, Majors and The Fraternity took it upon themselves to attack Mustang and his partner while they were defending the Tag Team Championship. Nate Mustang demanded a championship rematch with Fredo Majors on December 2 at the Toys For Tots Toy Drive, and Fredo agreed, on one condition: it would be a Loser Leaves Town Match! The winner of the bout gets the belt and gets to stay. The loser gets the next bus out of town. This will be your last chance to see either Fredo Majors or Nate Mustang for a very long time. The "Thriller" Andd Bivians and Craig Francis have been going at each other for nearly a year. Their most recent encounter ended in a double countout. That won't happen on December 2 at Kelly's Banquet Hall when Andd Bivians and Craig Francis battle it out in a Lumberjack Match! Wrestlers will surround the ring, and their job is to prevent the action from spilling out onto the floor. We don't know who will emerge victorious, but we do know this match will not end in a countout! In October, Lance Scaper won the right to challenge for either the United States or Tag Team Championship. He chose to go after the tag team belts Kleetus as his partner. They will have their shot at reigning champions The Sons Of Liberty at Toys For Tots in Wrightstown. But Scaper & Kleetus aren't the only ones getting a shot at gold (which will be defended by Spectrum & The “Lost Boy” Jay Kirby.) Since their championship bout with The Sons Of Liberty was interrupted by The Fraternity in November, Doom Crew (Manabo & Oliver Bailey, along with that weaselly little Joe Wolf) has demanded a rematch. Additionally, Spectrum & Kirby want nothing more than to get their hands on Fraternity members Ace Matthews & “Brilliant” Bobby Banks. All four team will compete in a Fatal Four-Way Tag Team Attraction! One member of two teams start. Anyone could be tagged in by anyone else and can be subject to immediate disqualification for failure to accept a tag. The first team to achieve a pinfall or submission wins! UWC favorites to be announced! PLUS a special appearance by Santa Claus! United Wrestling Coalition has earned its reputation for running family-oriented pro wrestling events. The events are designed to offer the very best entertainment while enhancing the community and helping to raise awareness and capital for various worthy causes. This year's event is sponsored by Lucas Chrysler Jeep Dodge of Mount Holly as well as Kate & Al's Pizza of Columbus Farmers Market. Once dubbed the largest single toy drive effort in Burlington County, UWC has been hosting these events for nearly 20 years. In that time, through the generous donations of loyal fans, local businesses, as well as the wrestlers themselves, UWC has collected well over 18,000 toys for the US Marine Corps Toys For Tots campaign. Kelly's Bar and Banquet Hall is making this venue available for this wonderful event. Please stop by and check out their banquet facilities. 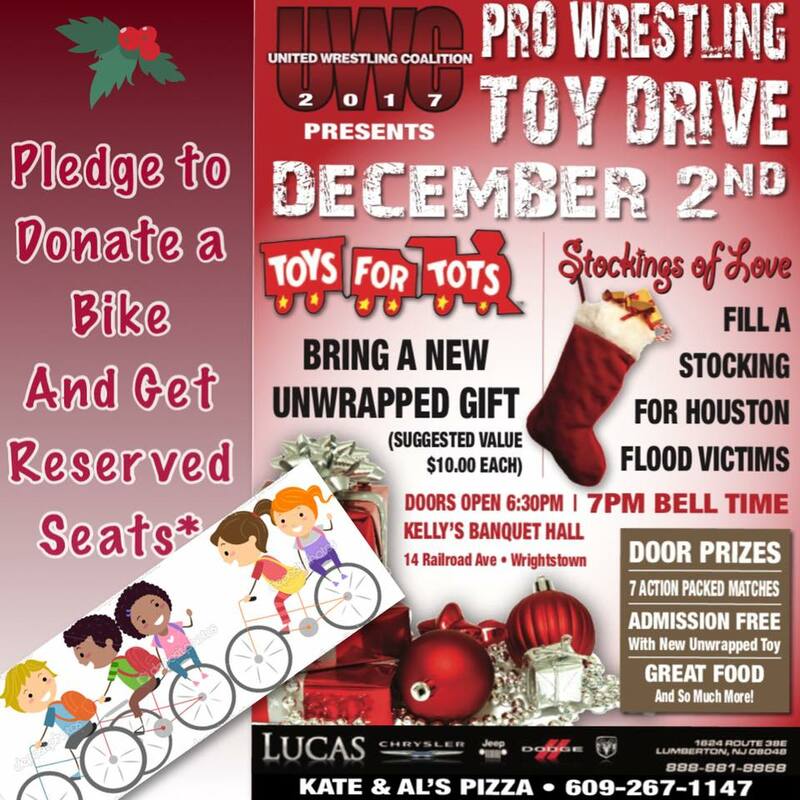 Remember, UWC returns with the annual Toys For Tots Pro Wrestling Toy Drive at Kelly's Banquet Hall, 14 Railroad Avenue, Wrightstown, NJ 08562, Saturday, November 11, 2017. Doors open at 6:30 p.m., bell time is 7:00 p.m., and tickets are only $10. Card subject to change. The show typically runs two hours, and door prizes will be awarded at the conclusion of the show. TOP 10 DOWNLOADS OF CKC 2017 !! New Episode of STS ! !